BCCI announces 15-member India squad for the World Cup in England and Wales. 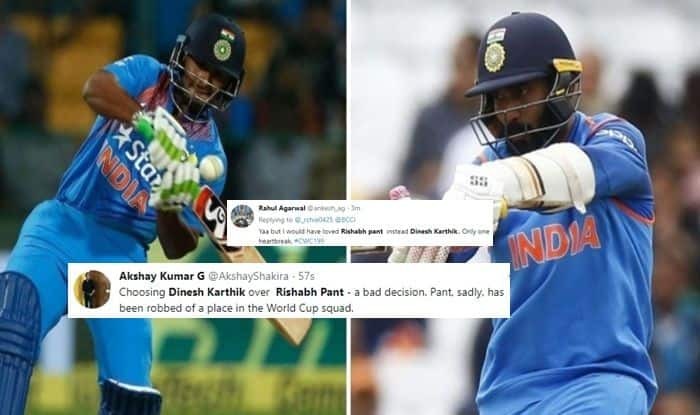 Dinesh Karthik over young Rishabh Pant and that made headlines after BCCI announced a 15-member squad for the World Cup Squad. KL Rahul also made it to the squad on the back of some brilliant knocks in the ongoing IPL for Kings XI Punjab. Apart from that, it is a squad according to expected lines. The news was out that the team would be announced today and it happened. It created huge social buzz as fans expressed their views over not picking Pant, who is the future instead of Karthik who is almost done. Most of the fans seemed divided with the move. I think #dineshkarthik and not #RishabhPant is a good decision ! Meanwhile, eleven world-class venues will be used in the 46-day tournament in which each side will play the other once in a single-league format with the top four sides after 45 matches progressing to the semi-finals.